Justin doesn’t have any brothers or sisters because he is an unico hijo (only son) and our only child. Every once in a while, though, he gets to see his cousins, children of my older sister Ate Cristy. 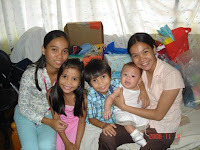 This entry was posted in Bonding Moments, Cousins, Mommy Moments. Bookmark the permalink. it feels good to see our babies mingle with their cousins. it teaches them how to interact and how to make friends and of course, have lots of fun with them every once in a while. Thanks for sharing these wonderful photos. I also have an unico hijo and it’s always a treat when he gets together with his cousins. thanks for joining us again this week! who can’t go wrong with video games to get kids together? your son’s a chubby cheeky? i bet he eats well. my son , 3 yrs old, so picky. our baby’s generation is very advance…learning to play PSP at an early age! It’s a cousin bonding time for my son too, and he enjoys playing with them. The good thing about mingle with older cousins is they (usually) happily sharing their toys/games.